Cats are great pets to have, but they can make quite the mess, especially when it comes to doing their business. Sure, litter and litter boxes work just fine, but they aren’t perfect. Waste and liquid can sometimes still make their way out of the litter box, not to mention those terrible smells too. Well, the New Age Pet ecoFlex Litter Loo is a great litter box cover, one that will provide a little house for the litter box. Your cat can get in and out, the box is out of sight, and smells stay where they belong too. This is a quite an affordable and stylish little litter box cover. If you didn’t know any better, you might just think that it was a modern coffee table. The New Age Pet ecoFlex Litter Loo is a combination wood and plastic litter box cover that keeps the litter box out of sight, moisture off the ground, and the smell out of your home. It features a nifty cat door so the cat can get in and out with ease, plus a large opening door so you can easily change the litter. You don’t even need any tools to assemble it, which is quite convenient. The New Age Pet ecoFlex Litter Loo is designed for people who have indoor cats and are tired of messes and smells permeating the home. It’s a cool litter box cover that your cat can actually go inside of to do its business. It’s a good option if your cat tends to make a mess across the floor with the litter, and for cats who can’t seem to contain their own mess. There’s no doubt that cats make quite a horrible stink, making this a great option if you don’t want your home to smell like that, plus it helps make things look a little nice too. When you buy the New Age Pet ecoFlex Litter Loo, you get a fairly large litter box cover. It kind of looks like a little cat or doggy house, one with a door, that could possibly cover as a coffee table. Here you get everything you need for assembly, but you don’t actually need any tools to put it together. The whole thing is made of wood and recycled plastic to keep things environment-friendly. It’s easy to clean out and quite convenient. It even comes with little windows so your cat isn’t totally in the dark. In terms of the features, the New Age Pet ecoFlex Litter Loo is a pretty simple item. Of course, the best feature here is that this litter box cover is made of a mix of slick wood and recycled plastic. Besides the fact that it is environment-friendly, it also does wonders for the aesthetics of your home. First off, it hides the litter box from sight, because we all know that litter boxes are unsightly. Fits self-cleaning or automated litter pans; removable covered plug opening in back of unit. Eco FLEX never retains any moisture, thereby eliminating odors. If your pet has an accident, simply wipe clean. NEW sealed floor design! No leaks and your floors stay dry! 10 Year Manufacturers Warranty and the best customer service in the industry! We stand behind our products and want you to be happy! Next, since the material used is slick and non-absorbent, if your cat makes a mess and misses the box, it will contain that mess without absorbing anything. In other words, it’s very easy to clean and wipe down, and it keeps the mess off the ground. At the same time, it works wonders to contain that horrendous stink which such critters can create. On a side note, this litter box comes in various finishes so you can match it well with the décor in your home. The New Age Pet ecoFlex Litter Loo features a large front door which you can easily open and close to clean out the interior and to change the litter. It uses a magnetic latch to stay securely in place, while also making the box easy to open. 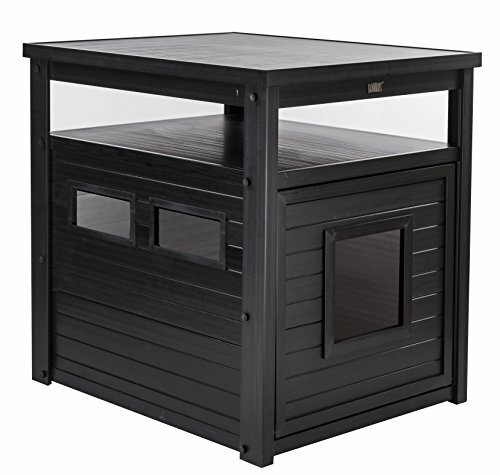 This item can accommodate regular and large litter boxes, as well as large self-cleaning litter boxes. Moreover, it features a nifty little kitty door for easy access for your cat, plus it has a couple of windows so it isn’t totally dark on the inside. The New Age Pet ecoFlex Litter Loo also features a top that can double as a table. The New Age Pet ecoFlex Litter Loo is very easy to use. To assemble it, simply follow the instructions which are provided. It’s convenient because you don’t need any tools for assembly. Insert the litter box with litter into the New Age Pet ecoFlex Litter Loo, close the large door, and you are good to go. This is a very simple yet effective item, one that really doesn’t need too much explaining, but it certainly does work wonders to contain kitty messes, smells, and to make your home look just a little bit better too. 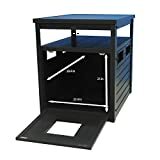 In case you don’t like the New Age Pet ecoFlex Litter Loo, for whatever reason, you can also take a look at the Petsfit Espresso Double-Decker Pet House Litter Box Enclosure. In case the name is not clear enough, this is a double decker cat litter cover; it’s designed for 2 cats and 2 litter boxes. This is good if you have multiple cats, because cats often do not like sharing litter boxes with one another. On this litter box, instead of the door opening vertically, it opens up horizontally, but other than that, both products are virtually the same thing. The Petsfit Enclosure also doubles as an end table. If you are tired of having your home smell like your cat’s mess, the New Age Pet ecoFlex Litter Loo is a good way to go. This is a fairly affordable and super useful litter box cover. It helps to keep the mess out of sight; it keeps the mess off your floor; and it makes things really easy to clean. Looking nice and doubling as an end table is just an added bonus.